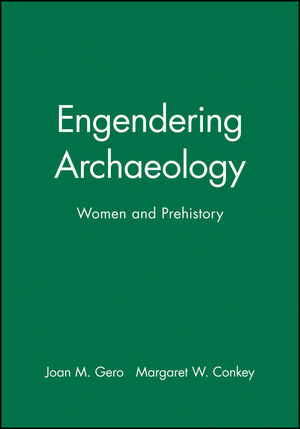 This pathbreaking book brings gender issues to archaeology for the first time, in an explicit and theoretically informed way. In it, leading archaeologists from around the world contribute original analyses of prehistoric data to discover how gender systems operated in the past. Joan M. Gero is Assistant Professor and Graduate Director in the Department of Anthropology at the University of South Carolina. She has previously edited The Sociopolitics of Archaeology. Margaret W. Conkey is Associate Professor in the Department of Anthropology at the University of Californis, at Berkeley. Part I: Considerations for an Archaeology of Gender: . 1. Tensions, Pluralities, and Engendering Archaeology: An Introduction to Women and Prehistory: Margaret W. Conkey and Joan M. Gero (University of California at Berkeley and University of South Carolina). 2. Gender Theory and the Archaeological Record: Why is There No Archaeology of Gender? : Alison Wylie (University of Western Ontario). Part II: Space and Gender Relations: . 3. Contexts of Action, Contexts for Power: Material Culture and Gender in the Magdalenian: Margaret W. Conkey (University of California at Berkeley). 4. Households with Faces: The Challenge of Gender in Prehistoric Architectural Remains: Ruth E. Tringham (University of California at Berkeley). 5. Gender, Space and Food in Prehistory: Christine A. Hastorf (University of Minnesota). Part III: Material Aspects of Gender Production:. 6. Genderlithics: Women's Role in Stone Tool Production: Joan M. Gero (University of South Carolina). 7. Women's Labor and Pottery Production in Prehistory: Rita P. Wright (University of New York). 8. Weaving and Cooking: Women's Production in Aztec Mexico: Elizabeth Brumfiel (Albion College). Part IV: Gender and Food Systems:. 9. The Development of Horticulture in the Eastern Woodlands of North America: Women's Role: Patty Jo Watson and Mary C. Kennedy (Washington University). 10. Shellfishing and the Shell Mound Archaic: Cheryl P. Claassen (Appalachian State University). 11. Pounding Acorn: Women's Production as Social and Economic Focus: Thomas Jackson (Biosystems Analysis, Inc.). Part V: Images of Gender: . 12. Whose Art was Found at Lepenski Vir? Gender Relations and Power in Prehistory: Russell G. Handsman (American Indian Archaeological Institute). 13. Women in a Men's World: Images of Sumerian Women: Susan Pollock (State University of New York at Binghamton). 14. What this All Means: Towards a Feminist Archaeology: Janet D. Spector (University of Minnesota). Epilogue: Henrietta L. Moore (London School of Economics and University of London). * First book bringing current feminist scholarship to prehistoric studies. * Illuminates the central importance of gender to the organization of social life in prehistory, and of gender as an historical process. * Reveals the important yet previously neglected part that women played in creating the archaeological record and advances a controversial thesis - that women rather than men are responsible for the majority of it.